No matter what kind of countertops you have, they will eventually need to be cleaned. While there is an abundance of choices for our countertop decor, there are many ways to damage those surfaces with improper care and cleaning. Not sure what kind of countertop you have? Or maybe you just need some general rules to use when cleaning all countertops. Most countertops will do well with just a damp microfiber cleaning cloth. The more serious your cleaning regime, the more you need to know about what type of countertops you have. Many countertops need to be protected from dulling their finish with abrasives. Really with all countertops, a little bit of cleaning right away goes a long way. Solid surface countertops can be a beautiful addition to your home. Because these countertops come in a variety of colors, they are very popular in new construction and renovations. When it comes time to clean these synthetic stone countertops, dish soap may actually be your best friend. If your countertops have a shiny surface, refrain from harsh abrasives, relying instead on baking soda for tough cleaning spots. Slate countertops are not the easiest to care for. They can be brittle, prone to cracking. Slate countertops are also prone to staining from oil. They can also be damaged by abrasive cleaners or products. Your best bet will be regular dusting and using a pH neutral stone cleaner. 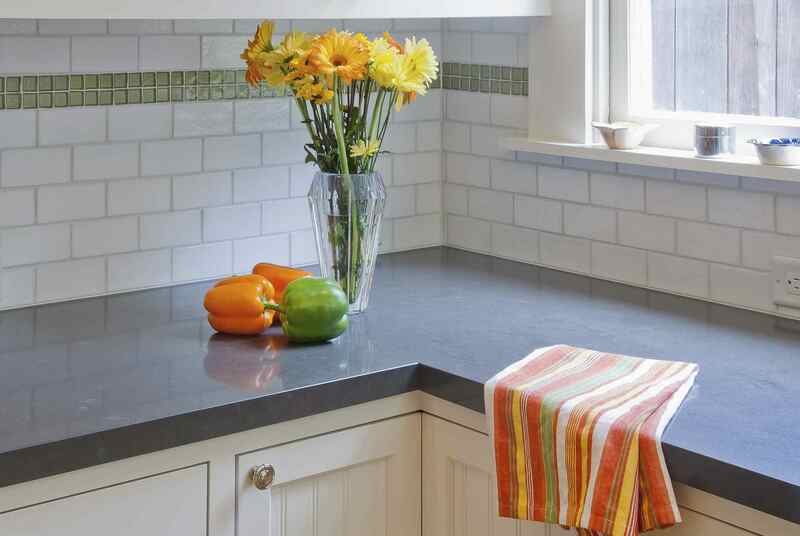 While you have to be careful with slate countertops, it is possible to keep them clean and beautiful. Laminate countertops are inexpensive and very prevalent, especially in older homes that haven't had many renovations. That being said, laminate countertops can be very beautiful and functional in a home. Laminate countertops stand up to a ton of spills and potential damage. They can be damaged, however, usually from water. Laminate countertops have seams where the pieces are put together. Excessive water can swell and buckle the countertops. Make sure that you don't use excessive amounts of water. A little goes a long way. It's a good idea to go ahead and dry the countertops after they are cleaned to prevent water from getting into the seams. For stains, a baking soda paste may need to be used to draw up the stain. Marble has long been prized for its beauty and durability. While marble countertops may not be as prevalent as some of the other types, they are amazingly gorgeous and add incredible value to a kitchen or bathroom. Bakers love using marble countertops for the cool flat surface that makes rolling out cookies or pie crusts a cinch. Marble countertops are subject to scratches, pitting, cracks, stains, and even dulling of the shine. To care for marble countertops water will often do best. Avoid vinegar and any other acidic substances like lemons or tomatoes. These countertops may need to be resealed regularly. Granite countertop has been very popular in new construction and remodeling. Granite countertops are a selling point in homes and will continue to be. Granite is a stone, so tough and abrasive cleaners should be avoided to prevent etching and scratching. Granite can be susceptible to stains, especially oily stains. A baking soda paste or poultice may need to be used to draw the stain back up out of the stone. Granite responds well to mild cleaners like water and dish soap. Microfiber cloths will work well at removing dirt without scratching the surface. Stainless steel countertops may make you think of industrial or restaurant kitchens, but they are also popular in homes. Stainless steel countertops are the tops when it comes to sanitary working conditions. They are also modern and beautiful, making them a great choice for a kitchen. Stainless steel can be dented. Scratching is also very common, although over time scratches seem to blend into the countertops. Stainless steel shows smudges and fingerprints very easily. Water left on the surface to dry will often temporarily spot the stainless steel. Proper cleaning will prevent stains from every being a problem since acids and oils don't bother stainless steel. Dish soap works well on stainless steel, as do mild abrasive cleaners. It's a good idea to dry stainless steel countertops to prevent water spots. There are also a number of stainless steel cleaner products on the market.